Arrests as Europe tightens security Jump to media player Greek police arrest four terror suspects as security precautions are stepped up across Europe. Terror suspects 'had police uniforms' Jump to media player Belgium is on high alert after a major anti-terror raid in which two suspected Islamist militants were killed. Amateur video of Belgium terror raid Jump to media player Amateur video shows the terror raid in Verviers, eastern Belgium, as it takes place. Soldiers mobilised to protect Belgium Jump to media player Troops are deployed across Belgium to protect the country from any potential terrorist attacks. Security high at French Jewish school Jump to media player The BBC's Chris Bockman says security is tight at a Jewish school in Toulouse which was the scene of a fatal attack in 2012 by French Islamist Mohammed Merah. France mobilising 10,000 troops Jump to media player Defence Minister Jean-Yves Le Drian confirms that France is mobilising 10,000 troops to boost security after last week's terror attacks in Paris, which left 17 people dead. Police in Greece have detained four people over alleged links to a suspected terror plot in Belgium, amid heightened security across Europe. 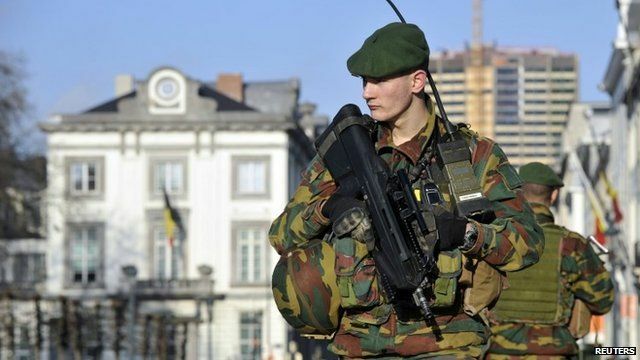 Troops have been deployed to help protect key sites in Belgium for the first time in 35 years, following a series of raids on a group of suspected jihadists on Thursday. More than 20 people have been arrested in Belgium, France and Germany.